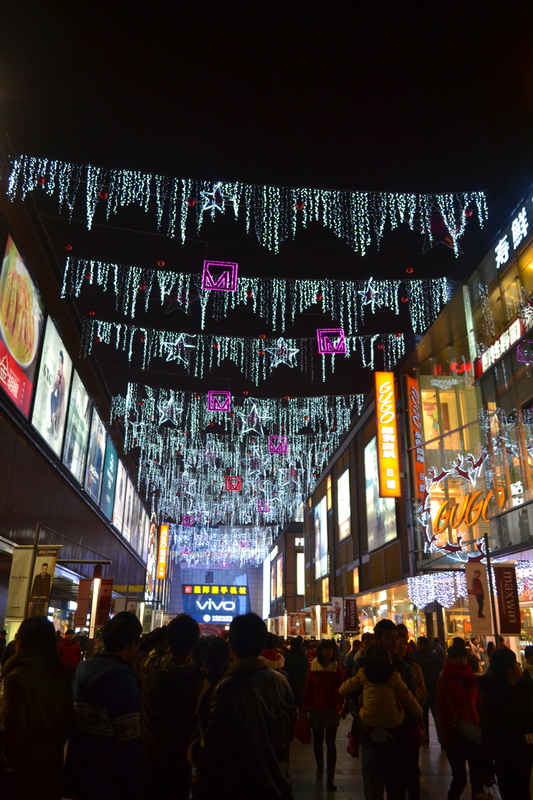 For some reason Chinese people believe that Christmas Eve is a big deal. Maybe they think it’s like New Years Eve or something, I’m not quite sure. Regardless, all of the English teachers wanted to celebrate with me on Christmas Eve. 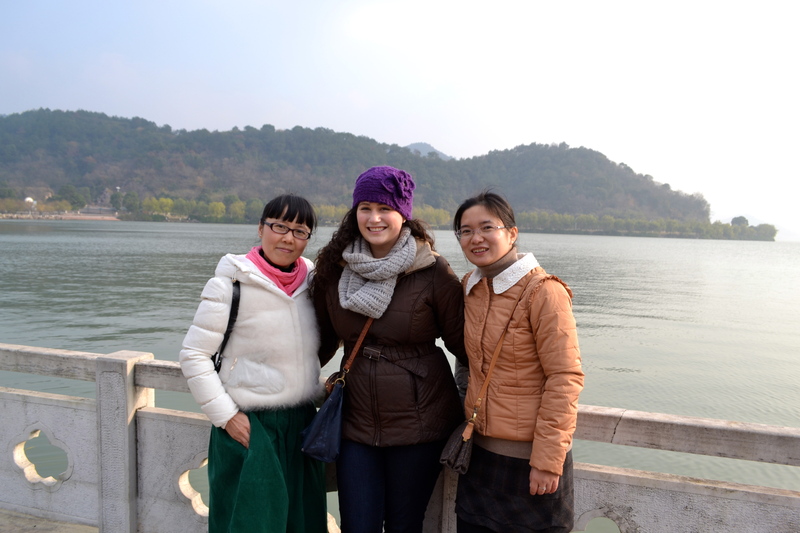 The school planned a giant banquet for all of the English teachers, and they pulled me out of classes early for a visit to Dongqian Lake (or East Money Lake). After teaching a Christmas-themed lesson to third graders who can barely speak English, I met up with Aaron, Lora, Shirley and Lynn for the lake excursion. It was FREEZING outside, so I layered up with a hat and gloves and poured some hot tea in a thermos. It was a tough choice between bringing my DSLR and keeping my hands warm with my little monkey hot water bottle hand warmer muff thing.. but I chose awesome photos over comfort. Dongqian lake is the biggest lake in Eastern China. While it’s nothing compared to Qinghai Lake, which I visited this summer, it was still beautiful, and it was nice to get out of factoryville for the day. The lake also contained a beautiful temple, which we wandered around for a bit. The other teachers asked if I had ever been to a Chinese temple before, and I responded, “too many“. Visiting temples in China is like visiting churches in Europe, after the 10th one they kind of all look the same, but I enjoy visiting them and taking pictures nonetheless. After we could brave the cold no longer, we stopped for “afternoon tea” at Starbucks. Like I mentioned in my previous post, #ChinaFacts, Chinese people don’t drink coffee in the morning, they like to drink it in the afternoon, preferably at an expensive coffee shop with desserts involved. Starbucks in China is pretty expensive. It’s 27 kuai for a tall latté, which is about $4.45. That’s a pretty steep price when I can get a meal in the cafeteria for 6 kuai. Good thing the school paid for it! The group of us ordered coffee, cheesecake and tiramisu and thawed our hands on our warm coffees. Side note, real cheesecake is almost impossible to find in China (most of the bakeries serve something vaguely resembling cheesecake but it’s not the real thing), but Starbucks actually has real, genuine cheesecake! You’re welcome. We talked about some light topics over our “afternoon tea” like average teachers salaries in America and my personal view on communism vs. democracy. After our afternoon tea, we headed out to the fancy hotel nearest our school in the “new city”, aka “fancy buildings that are all under construction town”. We got to personally pick out all of the dishes for our banquet. 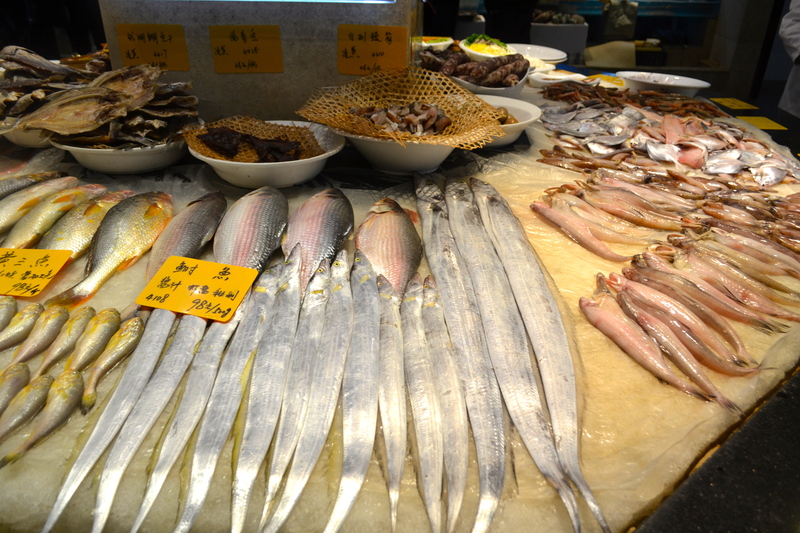 I let the teachers pick out random dishes while I took photos of fish heads that are larger than my own. Eventually everyone arrived and we all sat around a giant table. The waiters brought dish after dish after dish, most of which was weird seafood because it’s Ningbo. We had raw oysters, clams the size of my fingernails, spicy frog, snails, shrimp, crab and much more. My favorite was when they brought out a GIANT fish head. 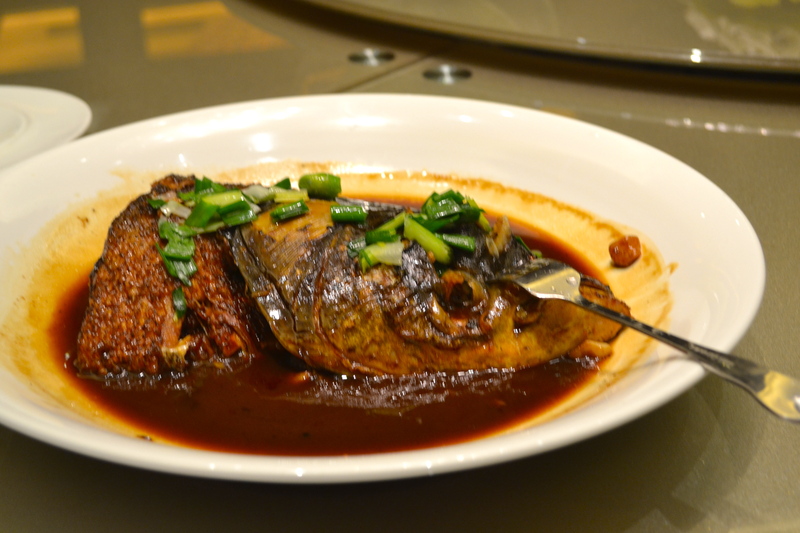 We mainly ate the neck part of the fish, but of course, they have to bring out the whole head for presentation. I also had warm corn juice in a wine glass, which was an interesting experience. I got really excited and thought it was a mango smoothie… nope. Overall the food was really good and I tried everything. I was bursting by the time the meal ended. 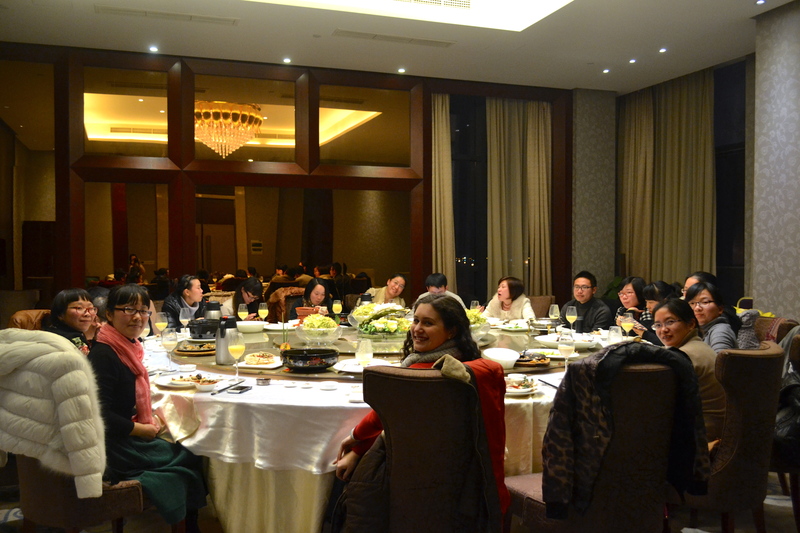 Banquets in China always end really abruptly. Normally in America you have dessert, or you spend a solid hour talking over drinks after you’ve finished eating, but in China you spend so long eating all of the dishes that once all of the plates have arrived, everyone abruptly leaves. Eating at a Chinese banquet is sort of like those 3 hour action movies: You think they’re about to end and they just keep on going. I can’t even pace myself because I never know how many dishes people have ordered! I also thought it was a bit awkward that no one was drinking. I felt like there should have been wine involved, but that’s just me. Originally, I thought that the Christmas Eve Banquet was planned because I was at the school and the teachers wanted an excuse to have a giant dinner to celebrate and have the school pay for it. I thought, “Wow, the school is so nice to host this for me”. Apparently, the school pays for the English teachers to have a banquet on Christmas Eve every year. Just the English teachers. I guess I’m not so special after all? After the banquet, one of the teachers drove a group of us back to the school and I actually thought I was going to die. I’m sure my parents felt that way when they drove with my brother and I on our learner’s permits. She forgot to turn her headlights on until we got to a street that had no lighting, and she went about 10mph the entire way home. Thank god there was no traffic. Enjoying Christmas Day Off Work! The next morning I slept in and savored my morning off. I didn’t get the day off because it was Christmas or anything, I just randomly don’t have classes every other Wednesday. I did, however, have to meet in the music room at noon for a rehearsal for the New Years talent show. The school wanted me to sing, so I chose “Winter Wonderland”, a traditional song I could sing without music pretty confidently. I’m no American Idol or anything, but I can at least carry a tune which is why I was a mixture of excited and concerned when they asked me to sing in front of the ENTIRE SCHOOL. I also decided to have my Speech and Acting elective class sing Jingle Bells. I thought it would be a simple little song, but NOTHING is ever simple in Chinese talent shows. My class is full of nervous students who can’t carry a tune or sing loudly if their lives depend on it. We eventually found some music, which helped them at least stay on time. After our meeting, I came back and Skyped my parents, which was nice, but it was kind of weird because it definitely doesn’t feel like Christmas. No decorations, no tree, no Christmas music, no Christmas lights… I thought China would celebrate Christmas a little bit just for fun, but aside from some decorations in the city and my local grocery store, the only Christmas spirit I had was Pandora’s Christmas station and some paper snowflakes I made with the primary students. I did get to Skype my brother and grandpa for the first time, which was pretty nice. 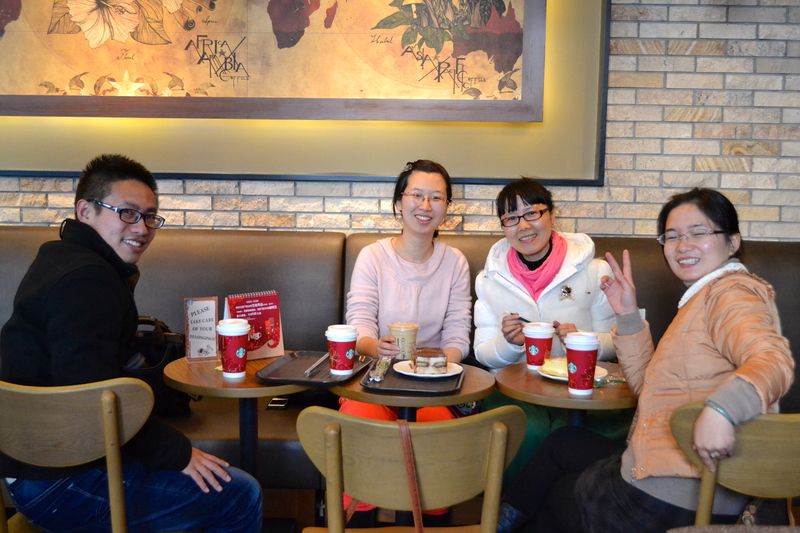 After a long talk with my family, I hopped on the bus to Tianyi Square to meet up with the other AYC teachers. I ran into them at the bargaining market where we helped one girl unsuccessfully look for a Christmas present for her boyfriend. Eventually, we decided to splurge and go to Starbucks (again!!) where we waited for the others to arrive. 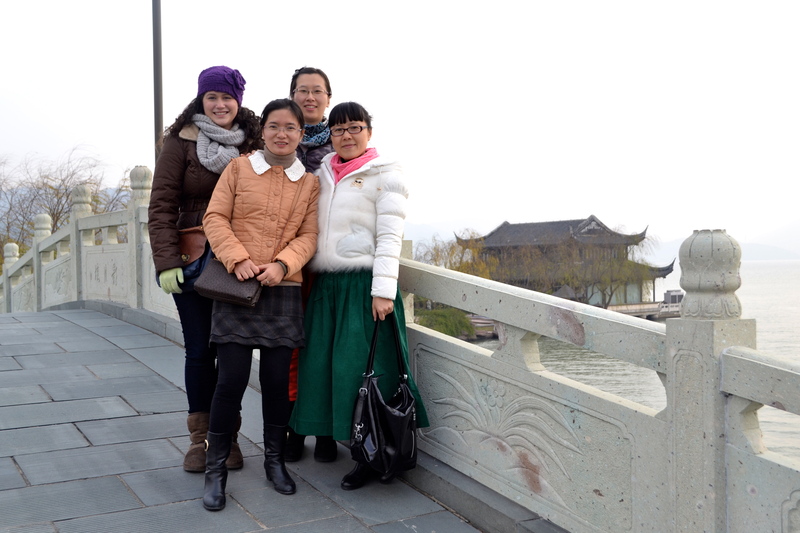 The group of us all walked to Laowaitan together where we went to a Western restaurant. I got a jalapeño cheeseburger, which I was really excited about, but it came way after everyone else’s’ food, even though two other people ordered the same thing as me. After dinner, we all went back to one girl’s apartment where we played Cards Against Humanity. After a while, I started to not feel very well. I thought it was because I was coming down with a cold and was exhausted, plus I had a beer with dinner which I thought might have irritated my stomach. 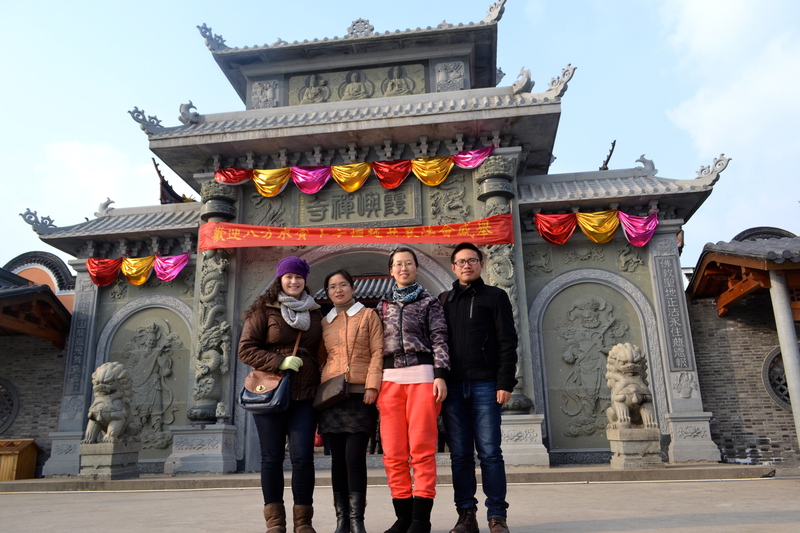 Eventually, I hitched a cab ride back with the Beilun people and got in a little after 11 pm. I felt awkward getting let in by the judgy security guards because I had class the next morning, but whatever. I took a few Tums, drank some water, and went to bed. Around 1 am I woke up feeling really awful. I got up to go to the bathroom and that’s when it happened: Food poisoning!!! I felt bad waking anyone up, so I took some of my American prescription medicine, which I promptly threw up. I wasn’t sure if I threw up the pill or not, so I waited another two hours and took the pill again. But this food poisoning would not be squashed so easily, so at 5 am I decided to call Lora and ask her to take me to the hospital. Lora didn’t answer my call, but she texted me a few minutes later to tell me she was asleep. I told her I needed to go to the hospital, but in China, people go to the hospital with a minor cold, so she didn’t really get it. She said, “Why? Do you have a fever? I can take you in the morning”. I replied telling her about my food poisoning, which got her attention. I keep telling them that Americans don’t go to the hospital unless we’re dying or bleeding everywhere, but they never believe me. I asked her if she could at least help me call an ambulance, but she offered to come to the school and drive me. When she finally arrived I couldn’t make it out of bed, so she got another male teacher to help me down three flights of stairs and into the car. We drove for a while along bumpy roads and I clutched my “just in case” plastic bag. Finally, we arrived at the hospital and the two of them led me into a dingy, dirty waiting room. I plopped down onto a metal bench seat and the entire thing lurched forward because it wasn’t screwed into the floor properly. Awesome. After about five minutes I was led to a doctor’s office. I wanted to scream that I needed a bed, but instead, I sat on a stool and laid my head on his desk while Lora answered all of the doctor’s questions. Eventually, they led me to a room with a bunch of wooden chairs and IVs. They’re going to put me in a chair?!!!! I started protesting that I needed a bed but was told that beds are only for emergency patients that arrive in ambulances. I told Lora to take me outside and call an ambulance so that I could have a bed and started “crying” (imagine a 5-year-old throwing a tantrum). The hospital finally agreed to give me their last bed, but if another patient arrived I would have to give it up. I was willing to agree to anything at that point so they led me to a bed in the hallway. The small emergency room was packed with old people. At first, I thought that they might be long-term patients and wondered why they were all in the emergency wing, but I eventually learned that all of the emergency patients just happened to be in their 70-80’s. The nurse hooked me up to an IV and I eventually fell asleep, waking up only to drink sips of hot water. At one point another emergency patient arrived and they tried to kick me out of my bed. I started crying again, and since I had completely lost my voice from throwing up so much, it was particularly effective. They found a stretcher from another wing and put her there. Eventually, it was time for me to leave. I left around 10 am or so, and the school sent a driver to pick us up. Lynn and Viviyao, two other English teachers, basically carried me up three flights of stairs to my room and bought me a Gatorade at my request. Lora brought me some soup (water with cabbage) from the cafeteria and I spent the rest of the day sleeping. The next day I woke up feeling a little bit better, but I had completely lost my voice to the point that I couldn’t even whisper. I had one class that day, and Lora asked that I teach it because they had important guests visiting the school. I told her that all I could do was show a movie because I couldn’t talk, and she told me it was fine because they basically just wanted to show off that they have a real-live white person. I threw on some jeans and uggs and hobbled my way to class. I didn’t even put on a bra under my coat- that was how much I cared. It was awful. The room was freezing cold and I felt like I was going to die… and guess what? No one showed up. Awesome. After that day, my health spiraled downward a bit. I was so incredibly hungry, but every time I tried to eat anything I started gagging like I was going to throw up, so for the weekend I survived off of bits of crackers, hot water, sprite, and Gatorade. I was so hungry my stomach hurt but I couldn’t make myself eat. On Sunday, Lora bought me a few apples because it was the only food I could think of that didn’t make me want to throw up. I finally decided to try ramen, and I actually celebrated on day 5 when I was able to eat an entire ramen in one sitting! Overall, it was a very interesting Christmas. I’m glad I at least got to have the Christmas Eve excursion and banquet experience, although I’m definitely regretting ordering that cheeseburger. On a lighter note, guess how much my hospital bill was??? $20 USD. TWENTY DOLLARS for a doctor’s visit, IV with medicine, pills, and a hospital stay of almost five hours. At first I thought it was a co-pay, but apparently, my insurance only kicks in if I spend over 1,000 kuai and I spent.. 130 kuai. No wonder the hospital was completely full. I’m taking the ambulance next time. I’ve posted a few photo albums below. Click on a photo to see the entire album in a large gallery slideshow! Just pick what you want! some sort of root thing? Ohhh, sorry to hear that happened to you. I haven’t been to China in 6-7 years but I got food poisoning every time I went. The Chinese public hospital experience is pretty dreadful. I have lots of memories of me standing in the hallway (no beds) with an IV in my arm, moan-crying. 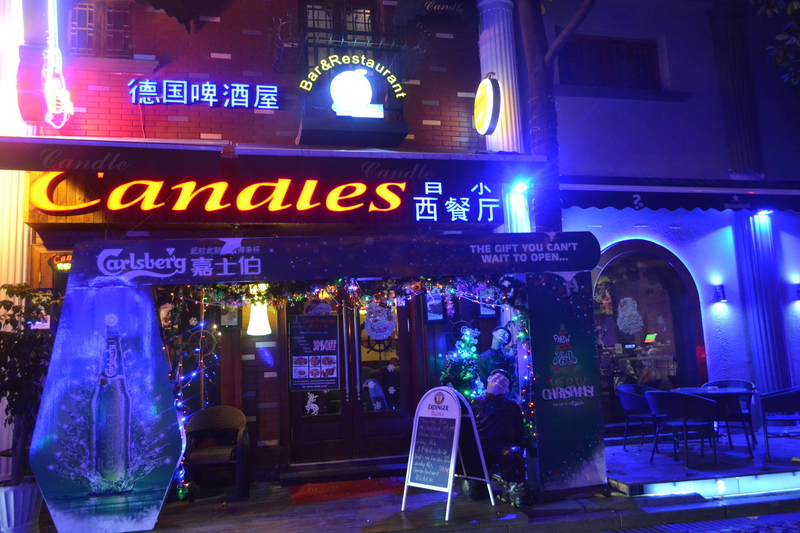 I rarely eat Western food in China and always attributed my food poisoning to the excessive (involuntary) banqueting. Btw, thanks for replying to my email and being so helpful. When I get to China in March, I’ll actually be interning at a hospital in Hangzhou, so it’ll be interesting to see how things work from the other side. OMG. I just spotted the biggest lazy susan EVARRRR.